Donald Trump believes that the government can closely monitor every individual entering the country to determine their likelihood of participating in a terrorist attack. He calls it “extreme vetting.” So surely his handpicked choices for the cabinet were vetted with that level of deep scrutiny, so no surprises would ensue after the selection. Yet Trump’s choice for defense secretary, retired Marine Gen. James “Mad Dog” Mattis (chosen, one assumes, for the nickname), has a very damaging association hiding in plain sight in his record—his current position on the board of directors of quack medical company Theranos. That’s right, current. It’s been more than a year since The Wall Street Journal raised questions about the celebrated biotech startup, which led to the company’s downfall. Yet there Mattis is, still listed on the board of directors. Former secretaries of state George Schultz and Henry Kissinger, former Senate majority leader Bill Frist, former defense secretary William Perry, and former Senate Armed Services Committee chair Sam Nunn have all backed away from the board. Another, construction company chairman and top investor Riley Bechtel, just stepped down today. But Mattis, given every opportunity to end his relationship with Theranos and its dodgy activities, is hanging in there. In actuality, Theranos was hiding its secretive technology rather than getting the proper FDA clearances because the blood test didn’t work in the way they claimed. The company’s lab practices caused potential harm to patient health, according to the Center for Medicare and Medicaid Services. There were multiple inaccuracies in the testing; 81 patients got unverified and potentially false results. The clinical labs have now all been closed. Walgreens, where Theranos had an exclusive agreement, has sued, along with a handful of investors. None of this stopped Mattis from joining the board in 2013, after he left active duty. This was part of Holmes’s strategy on Theranos: cultivate powerful friends and use them to increase the company’s credibility and influence. Only two of the 12 Theranos board members had experience in medicine, and one (Bill Frist) hadn’t practiced in many years. By contrast, six had government experience and two were military commanders. Clearly, this powerhouse board was assembled to iron out regulatory matters and get Theranos products into the lucrative military-procurement process. But even all that firepower couldn’t help when Theranos was caught selling bogus technology and lying to its funders. 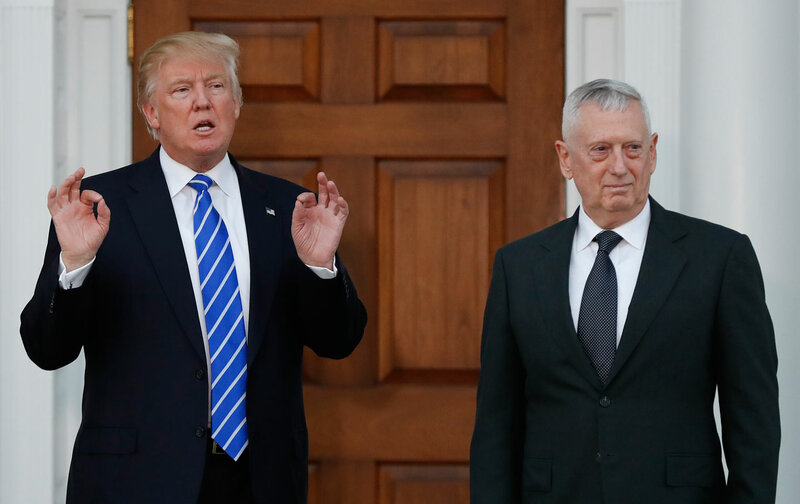 It is assumed that Mattis will leave the board now as he prepares to go into the government. And maybe it’s OK that he didn’t understand the depths of the deceit at the company in 2012. But the fact that he didn’t leave the Theranos board until now suggests either a troubling credulousness, an inability to admit a mistake, or a desire to stay on the gravy train. Theranos is a privately held company, so it’s unknown how much money Mattis made for his board position. But Holmes’s net worth was at one point $4 billion, and the company raised scads of money from venture capitalists, so it’s reasonable to assume that seat was lucrative. Mattis has a passion for corporate boards—he’s also on the board of General Dynamics, the major defense contractor. As Lee Fang wrote for The Nation in 2014, earning $88,479 in cash and stock options just in 2013. That grew to $264,070 in 2015, the last year for which there is data. The seeming meddling in the procurement process is a really giant red flag for an individual who would run the military. It’s one thing for the head of Central Command to run into bureaucratic difficulties when trying to get a product onto the battlefield; it’s another for the defense secretary to demand it, using the power not only inside the Pentagon but on Capitol Hill. The potential for crony capitalism is great. This result of Trump’s “extreme cabinet vetting” fits with his other selections. His education secretary married into a multilevel marketing fortune. His treasury secretary used a favorable government deal to profit off of foreclosure victims, just like his commerce secretary. His transportation secretary’s family owns a dicey shipping company. And now Mattis has ties to the biggest scam company in Silicon Valley. And heck, it fits with a guy who ran a fraudulent fake university. Maybe being linked to something shady is part of the Trump cabinet job description.